Summary: Collector Carter Hall receives a package from a friend containing an ancient Egyptian dagger. Looking at the weapon, he faints and flashes back to ancient times, where he is the noble Prince Khufu. Khufu defeats the agents of Hath-Set, the trecherous priest of the "Hawk god" Anubis, and reunites with his beloved Shiera. Hath-Sets army lays siege to their hold, and eventually Khufu is overcome and stabbed with the dagger, followed by Shiera. Waking back in the present, Carter goes outside to clear his head and runs into a frightened mob fleeing the subway. The tracks are glowing blue with electrical energy. In the mob, he runs into the spitting image of his ancient love, who is surprised that this stranger knows her name, as well as the fact that she has been having similar dreams! Taking her back to his home, Carter fashions himself a costume and wings made of Ninth Metal, and arms himself with a quarterstaff, and sets out to find the cause of the electrical disturbances. Hawkman goes to the home of Dr. Anton Hastor, electrical genius, and reincarnation of Hath-Set! After a short fight, Hastor hypnotises Shiera from afar, bringing her to his home. But Hawkman is prepared, tossing a net of Ninth Metal over her to break the spell, andu sing his crossbow to best his foe, and destroy Hastor's lab (and seemingly the doctor with it). Hawkman saves the day, and a new hero is born! 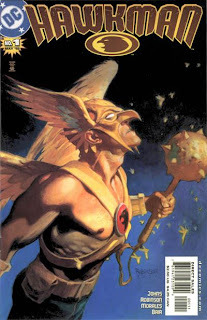 Review: And like that, the world was introduced to Hawkman. Gardner Fox may have bee trying to fill up pages but the story crafted here for the origin of this winged hero is very compelling, thematically tying more into the adventure comic strips of the time than anything already established as "superheroic." Similarly, Dennis Neville's art has a pulpy, Raymond-esque quality to it which fits the times nicely. Fun to see Carter as a blonde. I think Fox meant Osiris with the Hawk god, but Anubis is closer to the "god of death" than Osiris, so I guess it's a give and take. I liked Hastor's vague mad science lab, creating "lightnings" that somehow attacked the subway line. I have not read much in the way of Golden Age comics so these are still quite novel to me, and I really enjoyed the origin and introduction of the Winged Wonder. Is there any Hawkman related stuff coming out this week? You betcha! The Brave And The Bold v.2: The Book Of Destiny HC -- I believe Carter teams up with the (All-New) Atom herein. I wish they would release these as regular tradepaperbacks instead of hard covers, but I know they will eventually. DC Universe: Last Will And Testament #1 -- Not sure if the Hawks are in this but they might pop up. As to how Hawkman would spend his "last day," I have to think it would be hitting people with a mace. I mean, he's just going to get reincarnated and come back, right? Justice Society of America #18 -- Continuing the Gog storyline as Magog is introduced in the DCU proper. Hopefully he and Carter will get the opportunity to throw down. Picked up this very nifty little piece last weekend. 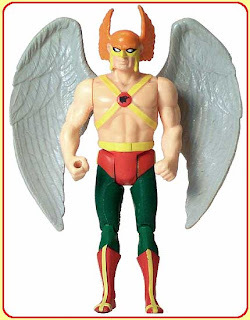 I had seen these "blind box" figures before -- namely, the Aquaman riding the seahorse one -- but I did not know there was a Hawkman until I was poking around the DC Direct site last week. I was in Greenville for lunch with my wife, and I remembered seeing these little blind boxes at Richard's (the "other" comic shop in Greenville). So, I knew they had the blind boxes, and I knew that they had them opened, so if they had Hawkman I would at least not have to bother with the blind box business, so the logical leap from there was pretty small. You follow me? The figure itself is about 3" tall from the base to the tips of the wings. It comes unassembled, and goes together very easily -- the legs plug into the torso, the wings into the back, the mace into his hand and then the feet into the base. (Also included is one part of the JLA satellite, which you can complete if you buy all six pieces; if anyone wants this piece, let me know.) Considering the size of the piece, the sculpting and paint applications are very nicely done, and Hawkman looks like the chiseled, buff dude he has been consistantly portrayed as since his rebirth. I like the inclusion of the additional weapons and the shield, clearly delineating this as the modern version of Carter Hall, ready to soar into action. This piece is really nice, especially considering it cost me all of $5. The small size means it can fit just about anywhere on your toy shelf, or on your desk, or wherever. There are two other waves in addition to this one, and all of them look pretty neat (hey Rick, there's a Plastic Man, too! ), so take a look for them at your local comic shop. Image: Who's Who Mystery Box Set Hawkman, retrieved from DC Direct. In addition to the previous post, DC Comics Executive Editor Dan DiDio mentioned Hawkman's status in the "Your Guide to the DC Universe" panel at Fan Expo this past weekend up in Toronto. The executive editor also said the recent Hawkman Special by Jim Starlin was an effort to test the waters for the character. "It was to create an air of mystery around the character and to create questions around the character. With the chance that people might get interested and discuss the character and want to read about him further down the line." More evidence for the return of Katar Hol as the "one true Hawkman" on New Earth. I think both characters can work equally well; whichever one they decide to go with, I just hope for fun, exciting adventures to read. I mean, a cosmic series or psuedo-Hawkworld deal would be fine with me. As would another series in St. Roch or Midway City. Maybe Carter Hall can hang out in St. Roch on Earth-2 and Katar Hol can be based out of Midway City on New Earth. Heck, if you really want to go whole hog, have Roderic kill Kendra and have her be reincarnated back on Earth-2, or something. All of it requires some hand-waving, yes, but it's pretty easily doable, and once you set the status quo you can tell good stories and not worry about it. Didio added that they were trying to find the best, most recognizable and most popular versions of all of their characters, including Aquaman, Hawkman, Batgirl and Supergirl, who he noted only really works for readers and for the general public when she is "Superman's cousin." Another hint about the return of Katar? Do more people really know Hawkman as space cop rather than reincarnated pharaoh? I suppose it's possible, what with Justice League lavishing a ton of attention on Shayera and Thanagar, and Katar's turn on The Batman. Hopefully something can be worked out so that Geoff Johns and David Goyer's take on the character can be preserved (Earth-2! Earth-2!) while opening things up for new cosmic adventures for the Winged Wonder(s). As for Aquaman, I agree with rob! -- give him the Man Of Steel treatment coming out of Final Crisis and just go from there. As I mentioned earlier this week, Carter and Ollie didn't exactly have a friendly reunion in St. Roch at the start of Volume 4. Here, Hawkman works the backhand. Later, after the case is solved, they bid their goodbyes in typical mega-macho fashion. Images: Hawkman v.4:no.5-6, 2002, Rags Morales. Review: A very cool little backup adventure for Hawkman and Gangbuster. Short and to the point, it gave a good introduction to the two characters as well as tied back into the main story (where we see where some of the relics they are stealing end up). The Outsiders cameo was amusing (Metamorpho is disguised as the relic, with the others as patrons; Rex makes a comment about Katana's sweet "gams" in her cocktail dress), especially considering I'm a fan. Nicieza's Hawkman is amusing, responding to Primat's comment about how good he smells with "We'll market a cologne after I bludgeon you!" The nerd in me must say, it's not "St. Roch Museum," but "Stonechat Museum," although I suppose the woman doing the introductions could have just misspoke. Tom Derenick's Carter is strong and bulky without being too much, and I like the look of the helmet with the red eyes peering out. Hopefully this team will be involved more in the story later on. The overall issue is not bad but clearly part of something larger. Image: Trinity #11, 2008, Andy Kubert. Summary: The murders -- via arrow impalment or the results thereof -- of several prominant residents brings Green Arrow to St. Roch. The Hawks witness the latest attack as it happens, and Hawkman confronts Arrow, thinking him the perpetrator. The two former teammates blast one another verbally, as Arrow explains that he is being framed. All of the victims were part of a business deal gone sour on some land south of St. Roch, of which Arrow was an investor. Seeking one of the surviving investors, the Hawks and Arrow come across The Spider, who's father was the Golden Age adventurer/criminal also known as The Spider. Hoping to rub out all of the other investors to get all of the money from the sale of the property for himself, Spider and Arrow being a furious back and forth duel. Spider is put down for the count after the Hawks double-uppercut him, and then Arrow wounds him in his aiming eye. 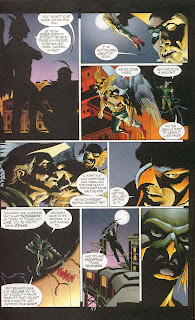 The plot stopped, Arrow and Hawkman make their tense and unfriendly goodbyes, but not before Arrow advises Hawkman to get out of the helmet and wings every once in a while. Carter takes Arrow up on his advice, and cleans up very nicely to take Jayita out on the town -- much to Kendra's surprise. Meanwhile, Spider physically pushes himself to regain his aim and be able to extract revenge. Review: The appearance by Green Arrow is very welcome, and Ollie plays a bit of the reader's devil's advocate, asking the questions that we were thinking, including "when was the last time you took off the helmet?" and "what do you know about love as opposed to obsession?" The interaction between the two heroes is downright hostile, with Hawkman flat-out telling Arrow to stay out of St. Roch at the end. Not that Hawkgirl is much nicer -- she tells Arrow that she can smell a "dog in heat" from a mile away, and that she was forewarned about him by Black Canary. The setup for the story was classic but treated well (a hero... framed! ), and the interaction of the three stars really made this one worthwhile. I am still undecided on what level of animosity I like between Ollie and Carter. Here, their bickering even extends into the battle ("You're in my line of sight!" "Then find a new one!") and really does demonstrate Carter's inflexibility. 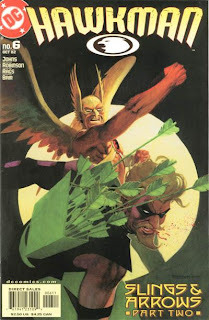 Image: Hawkman v.4:no.1, 2002, Andrew Robinson. What Hawkman related stuff is out this week? I've got your hook-up! Rann-Thanagar Holy War #4 -- I am not buying this series at the moment (honestly, I am waiting for the trade on a lot of minis right now), but Carter (or is it Katar?) figures pretty strongly herein. Trinity #12 -- Apparently, last week's issue began a back-up featuring not only Hawkman, but also the Outsiders. Why wasn't I informed of this?! I must rectify this situation! UPDATE: Trinity #12 did not continue the Hawkman backup. It was only in #11. Sorry for the confusion! Also, Showcase Presents: The Atom v.2 was released yesterday, for you Tiny Titan fans. Title: "First Impressions," "Into The Sky," "Lost In The Battlelands," "Beasts Of Burden," "Hidden Past and Hidden Future"
among the oppressed before being saved and returned home by Hawkgirl, who herself had her hands busy avoiding the military and recapturing the gem from a bloodthirsty Tigress. The two return to Stonechat, where they agree to stay on, and Carter tells Kendra that he wants to work as partners, and that we will not force her past lives upon her. Meanwhile, the mysterious Roderic sends Shadow-Thief and his team hunting for various powerful relics all over the world. The Hawks get wind of this and confront Roderic, who threatens them but takes no overt action. The encounter, coupled with an ancient dagger recovered by the Thief, triggers memories deep in Roderic's subconscious, as he re-discovers his heritage as Hath-Set, the cruel high priest of Prince Khufu and Princess Shay-Era, and their murderer. Also included are profiles on Carter, Kendra, Roderic, and the Stonechat Museum. Review: I ended up finding this through my local library after trying in vain to find it locally for purchase. I was not disappointed with this collection, and if I see it for sale I intend to buy it. Johns and Goyers, who get co-credits on the plotting, (along with James Robinson who pitches in as well) nicely establish a new home base and situation for the Hawks in the "City That The Saints Forgot" deep in the bayou. Stonechat also makes for a modern update to the classic Midway City Musuem. The interplay between Carter and Kendra is rife for conflict and really sets the tone of the relationship early on. Appropriately, even though his name is on the cover, Hawkman and Hawkgirl get equal treatment within, and are seen as equals, with Kendra saving Carter's bacon more than once. Roderic makes for a good villian, slimy and sleazy as a relic collector but substantially more menacing as the modern Hath-Set. Also quite well done are his team of mercenaries, all three of which shine. Tigress, whom I knew from the Injustice Society in the pages of JSA, makes a worthy adversary for Kendra. I had never read anything with Copperhead in it, but I knew him from Justice League, so seeing him in his post-Neron form was cool. And everyone loves Shadow-Thief. Rags Morales' rendition of the Hawks is equal parts grace and furious power; the "Conan With Wings" motif is taken to it's only logical conclusion to great effect. Heck, Patrick Gleason's turn from SF&O is even beefier, if you can believe it. As far as launching a new series, this is one heck of a way to pull it off, with plenty of action, drama, menace, humor, character, and plenty of open threads to pick up and run with. Come back tomorrow for the other story collected in this trade! The Super Powers Collection really brings me back to my childhood, as between my brother and I, we had nearly every figure from the line. Regularly mixed in with our Secret Wars toys, superhero battles were regularly scheduled affairs, when not staging epic military or furry underpants struggles, or promoting all-star wrestling cards. My brother and I were both of the persuasion that once a "guy" belonged to one of us, he pretty much stayed there until disinterest or whatnot. My core group consisted of Flash, Aquaman, Martian Manhunter, and Doctor Fate, who would usually fight Darkseid and Lex Luthor, as they were "my guys." One such guy who belonged to my brother was Hawkman. I remember the toy well -- he never got much use that I saw from my brother, and I really dug him for his big wings and the fact that he had a mace to hit people with, but, alas, he was not my guy, and so I let it slide. Fast forward a number of years and all of the Super Powers (along with the Secret Wars and later Toy Biz figures) are in my possession, thanks to a general cleaning out and packing up of toys and whatnot. So I finally got my hands on Hawkman, mwuahaha! So since that day in high school, he (along with all of his mates in the box they have been packed in, unpacked out of, and repacked in since that day) has traveled with me, from my parents house in New York to my first apartment in South Carolina, to my wife and I's first house to our current home. And he certainly is a toy worthy of such mileage. His large size -- both height and width, thanks to his wing harness -- makes him standout from the crowd in group shots, and his sculpting is pretty dead-on. The bright, vibrant colors which helped make this costume a classic in 4 Color form translates easily to the three-dimension world. As I said, I have always really liked his mace, which on my particular toy remains firmly grasped in his right hand, not lost or misplaced like many other accessories (I would kill for Aquaman's trident, or Manhunter's cape; I am pretty sure I have Fate's). The power action works wonderfully, and doesn't interfere with poseability, or the all-important stand-up-ability, either. 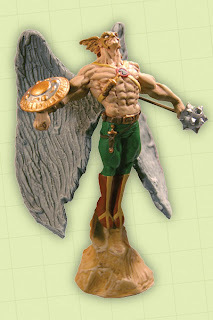 If you are talking classic, Silver Age Hawkman, this is him in the flesh (that is, plastic). This is my favorite Hawkman toy which I have ever seen or had the pleasure of owning. And while there are several new versions coming out soon, I think it will be very difficult to top this iteration of the Winged Wonder. Image: Super Powers Collection Hawkman, retrieved from Toyotter. Synopsis: In a side story to the ongoing Rann-Thanagar Holy War, Hawkman takes a trio of Rannian soldiers to investigate some strange energy readings, and winds up facing down the mysterious and seemingly omnipotent Demiurge in the battlefield of Carter's own mind. The Demiurge tells Carter that he has been living a lie, and has been dealing with it for so long that he simply has assumed it to be true. Shrugging off Hawkman's attacks, the Demiurge transports them to ancient Egypt, right as Hath-Set murders Prince Khufu and Princess Chay-Ara. Carter, unable to stop the proceedings, rages ineffectively, until the Demiurge begins to ask the hard questions: why has history completelt forgotten Prince Khufu? And his father? How many brothers did he have? Why has Cartner never thought about these questions before? The Demiurge reaches into Carter's brain and "removes" this imperfection, calling it part of a series of problems introduced because of the Crisis (Hawkman says the "Infinite Crisis," but the image more suggests COIE), before transporting them back to the present. Calling him one of the "Abberent Six," the Demiurge says that he and Hawkman shall cross paths again in the future, and says that Hawkman shall have to embrace his true identity: Katar Hol. Flying off, Hawkman wonders what all this means, how much of it was true, and why the Demiurge called him the name of a dead man. Review: This was an interesting one-shot, with a lot of weird goings-on and seemingly contradictory actions. So, is all the stuff that Goyers and Johns created now not true? Or is it only not true for the part of Carter that was Katar Hol? Remember, in The Return Of Hawkman we learned that Carter was reborn in Katar's body, and Katar's spirit eventually drifted off to rest. Could that be the problem? You'll recall that I speculated that we could get a split between Carter and Katar, and this development could theoretically support that -- since all these problems came about because of "The Crisis," it's not unreasonable to think that undoing said problems might involve undoing the combining of the two Hawkmen. Of course part of that is just fanboy wishful thinking on my part. Anyway, as far as the issue itself, it's pretty good, with lots of weird backgrounds and heroic poses for Hawkman for Starlin to show off with. The dialogue is a little heavy-handed for 2008 (at one point Hawkman actually shouts something to the effect of "Everything I know has been a terrible lie! "), but Starlin is certainly game on that end as well. Whether this will be but a footnote or a major turning point remains to be seen, but I felt this was worth the price. Picked this up yesterday at Borderlands since it was a light week. I have not had a chance to crack the spine on this bad boy. Actually, this is the first Archive Edition I have ever purchased, so I am very much looking forward to reading it. 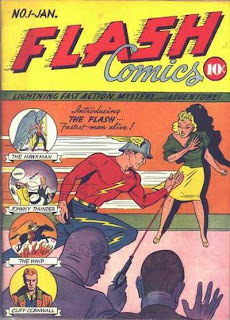 This volume collects the Hawkman stories from Flash Comics #1-22. Unfortunately, I don't think we will ever see a Volume 2. Or, what got me into being interested in and collecting this character in the first place? Like most readers, the first thing which attracted me to Hawkman was his look. 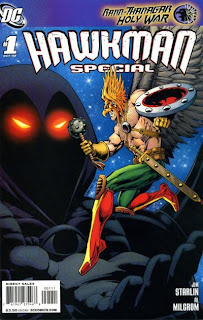 Sure, I liked his classic look -- see a later post I will write about the Super Powers Collection Hawkman -- but the look which first drew me to Hawkman was his post-Hawkworld, third title series look, with the black body suit and golden wings. As a 13 year old, this look was downright awesome. I bought the first two issues of the new series, missed the third, and then promptly never read it again. As I said, I was 13 -- I was not very smart, and I constantly chased new or "hot" things, and, evidently after missing an issue I deemed the Winger Wonder to be neither of those qualifiers. I remember buying and reading the issues, but I don't remember anything which takes place in them, although I am pretty sure that it was a mystery who was wearing the wings. I became reacquainted with the character through Goyers and Johns' work in JSA. When I finally took the plunge into JSA after hemming and hawing for months on end, I dove and bought the first trade, knowing full well than only two trades later was The Return Of Hawkman. Wizard had hyped that story quite a bit, gushing about how it solved all of Hawkman's problems and made him workable again, so I was eager to read it. 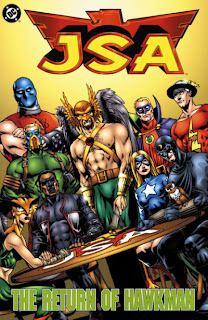 Of course, reading JSA, I soon became enamored with other members, including Sand, Atom-Smasher, Jay Garrick (whom I knew well from the pages of Flash), Mr. Terrific, and, yes, the new Hawkgirl -- but that's another post. Anyway, when I got to the third JSA trade, which is titled and collects The Return Of Hawkman, I really dug it. The alien cultural aspect of the Thanagarian conflict mixed with all of the reincarnation and other mystical stuff really appealed to different parts of my personality. And of course, the look, as rendered by Rags Morales, truly was "Conan with wings" -- a fearsome visage of a warrior stuck for some reason right in the middle of a Superhero comic book. Some don't care for the changes which ROH brought. For one thing. Nth metal is changed quite a bit, and now even more remarkable in that it can effect all four of the fundamental forces (gravity, electromagnetism, the strong nuclear force, and the weak nuclear force). A somewhat larger group were evidently much more unhappy with the apparent jettisoning of Katar Hol. As for the Nth metal, I'm sorry, but that is just plain cool. And Katar... well, I had no concept of Katar as a character. I had never -really- read his adventures, and so he didn't mean anything to me. As far as I was concerned, this Carter Hall was Hawkman. It's easy to see the progression from there. Hawkman was one of the main stars of JSA under Johns' watch, including serving quite a bit of time as the Chairman of the team. His take-charge, act-first attitude (that got him in trouble sometimes, such as during the Black Reign story), along with his ever changing arsenal of ancient weapons and his continued bad-assed appearance all conspired to make him the top character in the book for me. Fold into this Shayera's prominent role in Justice League, and the later appearances of both then psuedo-Katar Hro Talek, and then Carter Hall himself, and the seed which was planted years earlier pretty well germinated. I resisted such a transition initially. I have a few major titles and characters which I collect. For DC, the top one is the Flash, whom I have been reading for many years. I came to that table after Wally West had taken over the mantle, so my collection of Pre-Crisis Flash is woefully understocked, and I had thought to focus more on that as my Iron Man collection finishes up. So I tried to keep Hawkman at arm's length, lest I fall into another (admittedly less populated, issue-wise) character to collect. At Cons, Adama would kid me and taunt me with tantilizing Hawk comics, and I would deny them again and again. It got to the point where I would walk up to a dealer's booth at random and flip into a longbox and have Hawkman staring back at me. The Comic Book Gods were trying to tell me something. That brings us here -- from the humblest of beginnings to the full blown fanboy. I hope that this has served to illustrate just why I am talking about Hawkman in all his incarnations, and why I am going to end up spending a pretty penny on the Aerial Lawman in the coming months and years. If anyone has any thoughts to share on what they find attractive about the character, please post them as I would really like to hear them! Image: JSA: The Return Of Hawkman Trade Paperback, 2002, Rags Morales. Title: "Creature of a Thousand Shapes!" Synopsis: Katar Hol and his wife Shayera, police officers on the planet Thanagar from the Polaris system, track the criminal Byth to Earth. 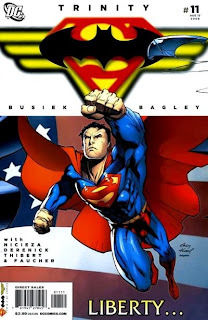 Using their technology, they imprint all of the collected knowledge of humanity into their brains, equip themselves with anti-gravity Nth metal flying harnesses, meet up with Midway City police Commisioner George Emmett, and get established in their secret identities as Carter and Shiera Hall, curators of the Midway City Museum. Byth, a crook who commits his crimes for kicks, has stolen (and ingested) a formula which allows him to assume the shape of any creature he has seen. 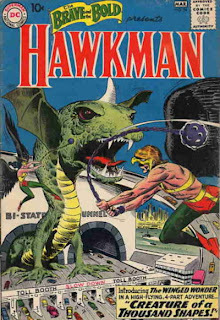 After several attempts to capture him, Byth faces down the Hawks as a large Thanagarian beast that resembles a dragon. 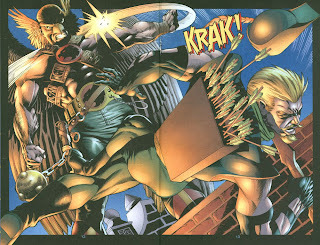 Hawkman and Hawkgirl put an end to his spree by tricking him into swallowing their maces, which were filled with an anaesthetic, then exploting the beast's only weakness -- getting punched in both of its face at the same time. Byth defeated, Katar and Shayera decide to stay on Earth to study police methods and procedures. Review: In line with the other DC Silver Age revivals, this story is pure science-fition, making no mention of anything historical save the weapons in the museum. All the trappings of the "classic" Silver Age status quo are established here -- the secret identity, the confidant who knows said secret identity, the home city, the main superpowers, the "romantic" interest (of sorts), and the motivation. Kubert's art is graceful and elegant, obviously best suited to the flying scenes. Fox is in his element, with a not entirely threatening but still entertaining villian in Byth, as well as the dunderheaded Mavis Trent, who hangs all over Carter despite the fact that his wife is his assistant. The Hawks are an impressive pair, really working as partners and not hero-sidekick, brandishing weapons such as maces, bows, and cestus. I never really figured that Shayera was side by side with Katar from the start, but that plainly is the case. Also, this is the first time I have ever read a story where Hawkman did not have his "Honor Wings;" it takes some getting used to from a visual standpoint. Shayera, however, looks as classic as ever. From this first story, it is not hard to see how the feature caught on at the time, with a fairly imaginitive backstory and the very attractive artwork. What Hawk-related stuff is being released to comic shops this week? I am glad you asked! Hawkman Special #1 -- Jim Starlin says that this might lead to a new ongoing Hawkman series. I have some wild theories, involving both Carter and Katar, but we shall see. Final Crisis #3 -- Not sure if Carter will show up in here or not, but if the DCU is going to hell in a handbasket, it's a pretty good guess he'll pop up. Justice Society of America #11 Poster -- Carter is right there with his fellow JSA mates and Earth-22 Superman on this Alex Ross cover blow up. Jim Starlin, author of all sorts of cosmic stuff over the year and presently writing Rann-Thanagar Holy War, weighs in over at Newsarama with his thoughts on the Hawkman Special, out tomorrow, and drops that this may be leading up to a monthly title. Personally? I wouldn't mind seeing some sort of return of Katar Hol of Thanagar, but not at the expense of Carter Hall of Earth. DC would probably never go for it, but if you can have two guys named Superman kicking around, multiple Green Lanterns, potetnially as many as three or four Flashes, and two Wildcats on the same team, then I see no reason why Carter Hall couldn't be the Earth-bound Hawkman who advetures with the Justice Society of America wearing feathered wings, while Katar Hol is the space-faring Hawkman, galactic police officer with shiny metal wings. I would really like to see DC turn up the heat on their cosmic titles outside of Green Lantern, and a Hawkworld-esque solo title for Katar would be a good fit. What do you think? Is there room for Carter and Katar in the same universe? BONUS: Check out some preview pages of the Special. Or, in other words, what is the purpose of this blog? Being Carter Hall is not a depository of knowledge. I don't think I am knowledgeable enough about Hawkman and his kin to be an "answer man" at this time. Sure, I know a lot about the character, but I don't posit myself as a superior expert or anything like that. No, instead my mission here is to document my journey into Hawk Fandom. In the past few years, as I have found myself becoming more and more of a DC Comics fan, I have regularly found myself drawn to Hawkman as a character. So as I "take the plunge," so to speak, into full-on fan and collector status, I want to share it with all of you. Everyone who reads or collects comic books will probably have a similar story at some point -- those heady days of the "honeymoon" when every story is new and interesting, that day you find a discount bin just absolutely jammed full of a character's title, alternating through the peaks and valleys as a publisher tries to find the right voice for your hero's title, and the day you find that rare Silver Age issue at a Con that you thought you'd never own. I hope that you will enjoy this little odyssey of mine. It promises to take us from the hallowed days of Egyptian antiquity, to the far-flung star Polaris and its planet Thanagar, to the present day, and beyond. We're about to take flight.